A lot of people have messaged me on various platforms asking for my opinion on Faxtar.com, one of the newest Bitcoin cloud mining sites around. More times than not, my answer was “It’s a scam,” even before I looked it up. See, there are too many scams in the cryptocurrency mining industry that finding a legit site is more of an exception than a common occurrence. That said, I felt that it was important to do some research on Faxtar.com and post my results here for everyone who might be interested in knowing how the site works. Do not hesitate to get in touch if you have any questions or need some clarification(s). As mentioned above, Faxtar is a new cloud mining site that promises big returns on investment in several digital currencies. Simply put, the site will sell you cryptocurrency in exchange for some dollars and then ‘invest’ it in unnamed markets to realize profits. They then share the profit with investors depending on how much each one invested and how much cryptocurrency they possess. Notably, Faxtar looks almost like a carbon copy of Metizer.com, also a cloud mining site that was established in 2016 before being outed as a scam and thereby closing shop. Faxtar has been online since February 2017 and it is only a matter of time before word goes out that it is a Ponzi, just like 90% of cloud mining sites are, which will (hopefully) kick it out of business. Like Metizer, the official Faxtar website has a purplish theme and is very shallow on information. As it is, we don’t know who the owners of the site are and which country it operates from. The only contact information is an email address ([email protected]). Nonetheless, Faxtar accepts investors from all around the world, including the United States. You will need to convert your currency to USD to transact with the site – if you are not from the US, that is. Of these, Bitcoin is the most profitable albeit most expensive. The minimum amount of each currency required for account activation is 0.0001 BTC, DOGE 2500 and ETH 0.1. You can make use of the calculator provided on the website to determine how much you need, in terms of USD, to purchase the cryptocurrency. Faxtar promises high returns on investment (ROI), much like a Ponzi scheme would. On the About Us section, the site claims that they always strive to pay investors annual ROI of more than 600%. Basically, you can use the provided calculator to calculate how much you should expect daily, weekly and even monthly. To put it into perspective, I will use Bitcoin as an example as it is the most popular cryptocurrency right now. Now, from a minimum deposit of only 0.0001 BTC, Faxtar promises daily returns of 1.4% with daily accruals. As it were, the more you invest, the more profits you will get. Apparently. However, the reality is quite different. From the people we asked, and from our own calculations, for an investment of $90, it would take you more than 3 months to get even at the offered rates of returns. Faxtar is definitely one of the lowest paying HYIPs in the Internet right about now, on top of being a scam. 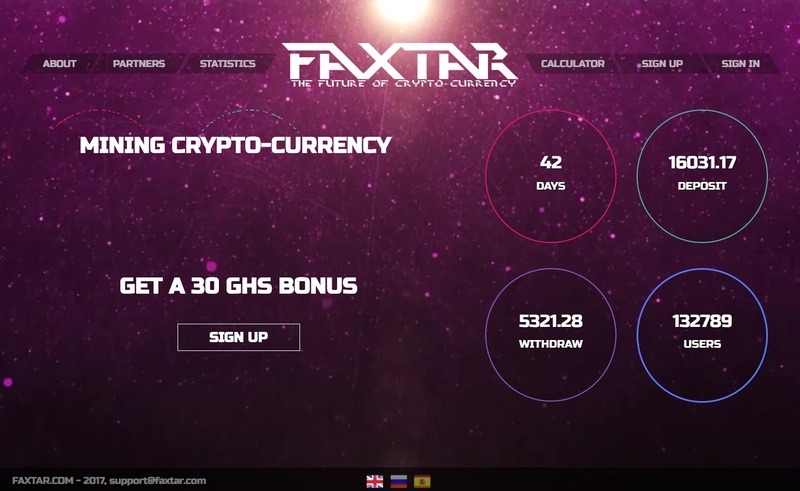 Everyone who has visited Faxtar.com can tell you that the site’s main selling point is the 30 GHs hash power that they give to new investors as a welcome bonus. To their credit, the power actually works but then again, what’s the point of mining cryptocurrency if you can’t withdraw it in cash due to unnecessary obstacles? FAXTAR – Scam or no scam? You might not believe it but Faxtar.com is a scam. We didn’t even have to invest in the site to find out. We could tell that there was something off about the site just by looking at it and reading online reviews. Before you call us haters, take a moment to read through the below points and perhaps you can begin to see things clearly. Faxtar.com has a very striking resemblance to Metizer.com, which was a confirmed scam itself. We would want to believe that the resemblance is a matter of coincidence but we know better. For one, Metizer offered the exact currencies offered by Faxtar and had a purple color scheme too. And you know where it ended up? In the trash bin, with a big SCAM sign. If not for anything else, we cannot trust Faxtar due to lack of originality. And even then, it would not be such a bad look if they had not copied a well known scam. Do not let the low figures deceive you.There’s no such thing as guaranteed daily profits in LEGAL business. The promise of permanent daily returns is something that HYIPs and Ponzi schemes have been using, and continue using to deceive people into investing in their scam businesses. As a fact, the site actually pays the returns for the first couple of days but as the reviews above can attest, the money rarely lands on the investors bank account. Faxtar has quite a low security standard for a website dealing in financial services. For one, there is no sign of any encryption system to protect client data neither is there a requirement for ultra complex password to make it hard to hack accounts. Even worse, there is no option for password recovery when someone forgets their password. In this case, they won’t be able to access their account permanently until they remember the password. Guess who the money in the said account remains with? You are right. We can say, without fear of contradiction, that Faxtar.com is a fraud. A scam. A Ponzi scheme. Waiting, thirsting for your hard earned money. Do not be a victim. Like Metizer before it, Faxtar won’t last long in the market with such a bad reputation. Our research indicates that the FAXTAR scam is mainly targeting people in Russia, Brazil, Portugal, India and the US. Verdit: FAXTAR is a SCAM! If you have been scammed by Faxtar, please tell your story in a comment below or contact us. We may be able to help you recover lost funds. To receive additional scam warnings from us directly to your inbox, please subscribe to ScamBitcoin.com! faxtar.com took too long to respond.